I've recently become acquainted with My Travellicious on twitter - a fantastic account to check out with you're going to be travelling/backpacking/going away - so many retweets from anybody posting about travel blogs so it's great to get first hand advice from the people that have visited the places you're looking at, or even to give yourselves some destination inspiration. So, Vietnam...a sad history of war and rebellion which means it has a substantial amount of culture to it and landmarks that must be visited. 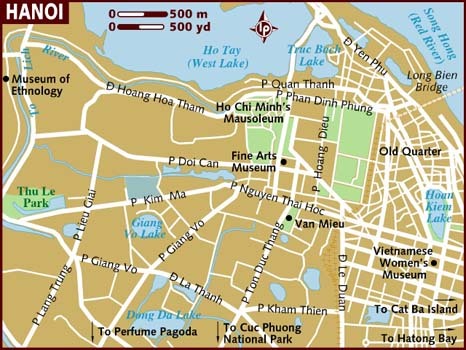 The capital is Hanoi, which is also the second largest city to Dalat and from what I've read, you can't really go wrong wherever you go in Vietnam. The only thing I will say; there's a lot of articles/blog posts on avoiding scams - Hanoi being a bit of a hot spot for this. So just be wary! Things to know: you need a visa - and you need to get it before arrival in Vietnam. Cambodia is probably the best opportunity for this and it allows you 30 days in Vietnam as a tourist. In the North is Hanoi which is a beautiful city of ancient streets, an old medival quarter and Hoan Kiem Lake. The North is said to be brlliant for backpackers due the to vast culture and activites. Hanoi Sapa Trek is well reviewed as well, I keep being told how good Vietnam is for trekking! The South is said to be a completely different vibe to the North. Ho Chi Minh City is the place to go in the South. There you can visit Dam Sen Park, The Reunification Palace, Giac Lam Pagoda (a historic Buddhist Pagoda - the largest in Vietnam and one of the oldest in the world). These are things that I've found are talked about and visited the most - and what's better than reading the opinions and advice of other backpackers who have visited! Other places to visit include the World Heritage Towns of Hue and Hoi An (UNESCO) which involves a lot of ancient ruins and temples etc. I don't just want to be sat on a beach for 6 months. Oh, and a must visit backpackers bar I have seen repeatedly Café Hoi An. 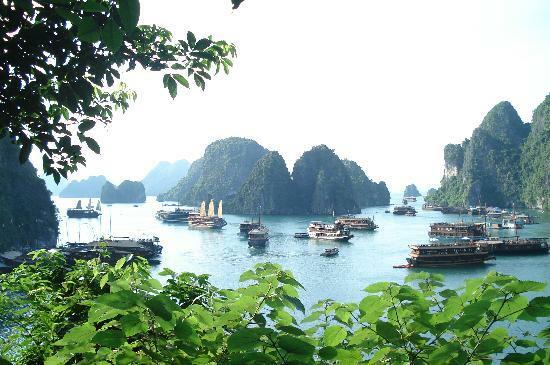 I am also desperate to visit Halong Bay - it looks incredible. I might not want to be on a beach for 6 months but I do want to see and relax on the best beaches I can during my trip. Nha Trang is meant to be the backpackers beach of Vietnam - lively, party culture. Mui Ne is meant to be quieter, while Phu Quoc is highly recommended for its picturesque setting. Must try Pho Bo and a drink called Bia Hoi - yep, means nothing to me either! I think it's the thought of the food that scares me the most. I'm always the first to want to try new foods, but in a foreign country there's always something that makes me feel a little uneasy! I'm trying to remain optimistic about Vietnam as I've had very mixed reviews and, I'm completely putting all my eggs in one basket with Cambodia - I'm so excited to go! Cambodia seems to have a million and one places that are recommended for a visit. However will we fit everything in?! Siem Reap is the place everybody talks about; it's the 'wild' Cambodia - parties, bars and 'pub street'. 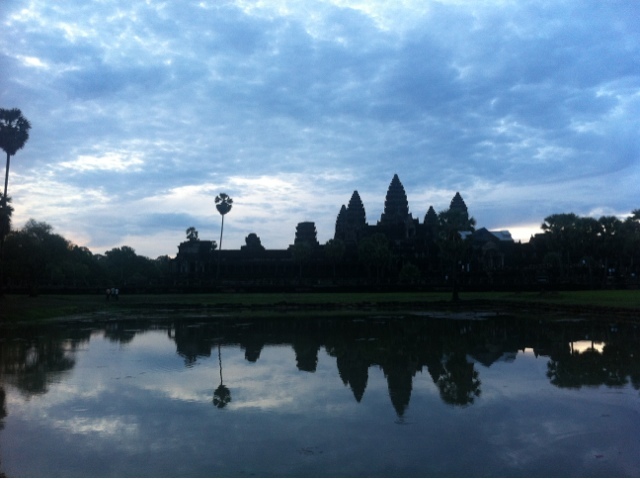 It's also the home of Angkor Wat - the place I am most excited to see during the whole of my travels. It looks absolutely incredible. Angkor Wat is a big Hindu complex and religious mount - the largest in the world to be precise. The architecture is absolutely breathtaking and I cannot wait to visit. Sihanoukville is also recommended for its party atmosphere and cheap accommodation. It's also on the coast so an ideal place to get boat rides across to the likes of Bamboo Island and Koh Ta Kiev, which is meant to be incredible for snorkelling. Another plus of Sihanoukville - the island hoping means you can visit some of Cambodia's beautiful beaches and the likes of monkey island, paradise bungalows, lazy beach and Crusoe island, which involves notoriously inexpensive beachside camping. Phnom Penh is another must-visit place with the killing fields Tuol Sleng museum. It is also home to an well reviewed market called Psar Tuol Tom Pong; if the name along doesn't make me want to go I'm not sure what else will! Here there's also Nature Cambodia and 2Cycle which means one thing - BIKE HIRE (yes, quads and normal bicycles - something we are keen to partake in, but shhh, my Dad can't know! I've also been told about a place called Frizz Restaurant, which offers half and full day cooking classes. This may sound like a bizarre thing to want to do on holiday/while backpacking but you all know I'm a keen cook and that I spend most of my days reading about food, so this seems really appropriate for me. Since I've been told about this place, I've had a browse and there seem to be no end of places offering cooking courses, the best bit? they're all so cheap! So I'm hoping to fit in a few of these in various places. As with Vietnam, you also need a tourist visa that needs sorting in advance. It requires a couple of passport photos too - tip: make sure you have PLENTY of passport pictures with you during your travels. I've read on no end of blogs that this is something very important. Another important thing - food and drink to try. Fish Amok on the food front and Sugar Cane Juice on the drink front. I've seen several suggestions to try both, so, why not! I will do a bit more reading on these places as my travel planning is still so jumbled. It's really hard to try and make plans when the only plan I have is that I know I'm flying into Bangkok for the 12th September and that I need to be in Ko Phangan for the 19th as there's a Full Moon Party. No pressure! But as I've said, my regular Travel Planning posts are designed to help me keep my own research together and hopefully to help all of you guys planning a similar root to make a start at planning your trip. It really is a minefield as every country has such an extensive list of things to do, but hopefully, together we will get there and I have no doubt in my mind that the trip will be anything short of incredible.